This simple, five-ingredient bread recipe is strictly "old-time" and produces a rustic-style Spanish bread. It's the kind that you see on abuela's (grandma's) kitchen table in pueblos across Spain. One recipe yields three 12-ounce loaves, so make it on a weekend afternoon and you'll have bread for most of the week. 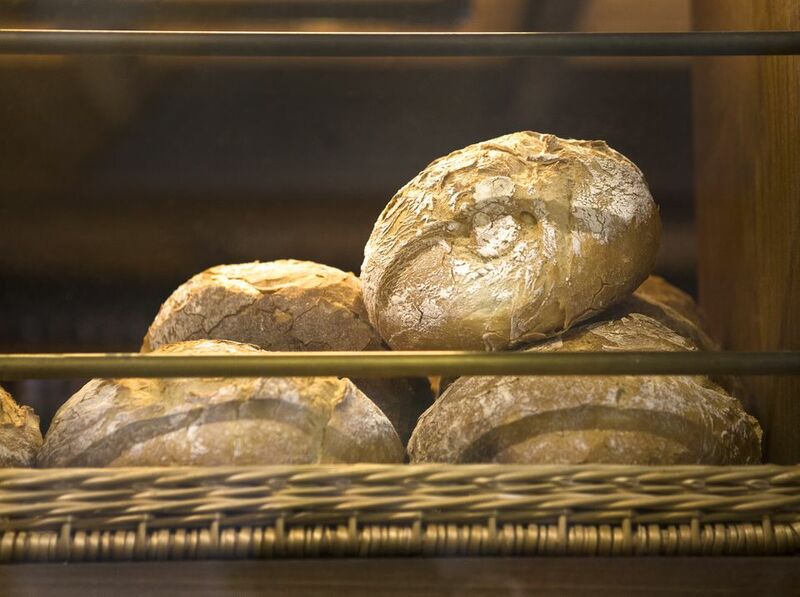 Weather conditions such as humidity and temperature affect bread making. The quantities of flour and water required for making suitable dough might need to be adjusted. This version was inspired by a recipe that appeared in Francie Martinez Vicondoa's book "Spanish Doors, Dishes, and Dreams." In a medium bowl, whisk together flour and salt and set aside. Pour dry yeast into a warm ceramic cup. Heat the water in a pan until it is very warm, but not hot. Pour approximately 4 ounces of water into the cup with yeast and stir with a fork until the yeast is completely dissolved. Pour yeast-water mixture and all but 1/2 cup water into a very large mixing bowl. Add flour to bowl gradually, continuously mixing with a wooden spoon until all flour is absorbed, adding the remaining water as needed. The dough should have a smooth texture and form a ball. Using a paper towel, coat the inside of a large bowl with olive oil or vegetable shortening. Cover the bowl with a wet dish towel and place in a warm spot in the kitchen. If your kitchen is drafty and cold, allow the dough to rise in the covered bowl in a warm oven (approximately 150 F) with the door open. Let rise for 30 minutes. Cover cutting board with a generous amount of flour to prevent dough from sticking. Turn dough out onto the cutting board. Flour hands and knead with heels of hands. When the dough has a consistent texture and forms a ball, divide into 3 pieces. Form dough into rounds or oblong shapes. Place on a cookie sheet or baking stone. Allow to rise in a warm place for 10 to 15 minutes. While dough is rising, heat oven to 375 F/190 C.
Cut slits in top of loaves just before baking. When the oven is hot, place bread on the center rack and bake for 10 minutes. Remove and brush with beaten egg white. Return to oven and bake for another 15 to 20 minutes. Bread should turn a light golden color. To store bread in the freezer: After bread has completely cooled, wrap tightly in plastic wrap and place in a sealed plastic freezer bag. Remove and thaw 1 hour before serving.